Bill, Jackie and family extend a warm welcome to all those staying at the Hambledon Hotel in the popular holiday resort of Shanklin on the beautiful Isle of Wight. Our aim is to provide friendly attentive service, comfortable well-appointed bed and breakfast or half board accommodation, plus an excellent standard of food and drink. We are open for holidays and short breaks for the whole family, with children of any age welcome. 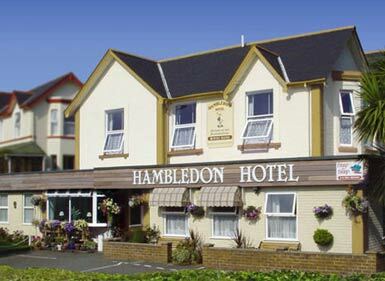 The Hambledon Hotel is only yards away from the famous Shanklin cliff path, which offers beautiful walks to both Ventnor and Sandown along the cliff tops. From here, there is also access to the safe and sandy beaches below, via lift or path. The hotel is within easy walking distance of Shanklin Old Village and Shanklin Chine, as well as the shops of the main town. A private off road car park is available for all hotel guests. The hotel is open from March to October and is a haven for families visiting the Isle of Wight during the summer season and equally popular with walkers in the spring, autumn and winter. We are one of only a few hotels in Shanklin to offer a choice of bed and breakfast or half board accommodation. Our guests enjoy excellent food and hospitality, and many of our visitors return year after year and we welcome them back as friends. All bedrooms are fully en-suite, centrally heated and double glazed, with colour television, clock radio and a beverage tray with tea and coffee making facilities. Family suites are also available. The lounge area is a comfortable and spacious room where guests can relax at any time of the day. Whether it is in the morning whilst reading the newspapers, or in the evening after an event filled day sampling the many attractions that the Isle of Wight has to offer, the lounge area is always available to use, however you wish. In the bright and attractive dining room, you can enjoy superb cuisine from a comprehensive choice of dishes, prepared by your resident hosts. The newly refurbished dining room is light and spacious whilst maintaining a strong sense of character and tradition. The bar area is a warm, relaxing part of the hotel where guests can sit and enjoy a drink or two after a fun packed day out. It is a great area to unwind and spend the evening socialising with the family or with the other hotel guests. Walking holidays are also available at The Hambledon Hotel, where excellent en-suite accommodation is combined with exhilarating walks through the Isle of Wight’s stunning coastline, downland, woods and villages. Please visit our website for full details.